FOUR DOUBLE BEDROOMED HOUSE SET IN 5.5 ACRES OF LAND WITH ADDITIONAL DETACHED TWO BEDROOMED COTTAGE WITH PLANNING FOR FURTHER TWO BEDROOM COTTAGE. A truly delightful character property with a stunning backdrop over open, rolling countryside and the Forest of Dean set in the idyllic and tranquil area of Elton. The main residence has been beautifully refurbished and offers charming and versatile living space. Sunnybank is accessed from a quiet country lane and boasts 5.5 acres of paddocks and formal gardens along with Honeysuckle Cottage which is a high standard conversion holiday let/ annexe. There is also potential to convert the stables into a further holiday let which has full planning and further potential for a third holiday let from the Red barn. This wonderful opportunity in this stunning setting would suit a variety of uses from equestrian, business use for holiday letting or working from home or just those looking for dual family living. OVERVIEW A truly delightful character property with a stunning backdrop over open, rolling countryside and the Forest of Dean set in the idyllic and tranquil area of Elton. The main residence has been beautifully refurbished and offers charming and versatile living space. Sunnybank is accessed from a quiet country lane and boasts 5.5 acres of paddocks and formal gardens along with Honeysuckle Cottage which is a high standard conversion holiday let/ annexe. There is also potential to convert the stables into a further holiday let which has full planning and further potential for a third holiday let from the 'Red' barn. This wonderful opportunity in this stunning setting would suit a variety of uses from equestrian, business use for holiday letting or working from home or just those looking for dual family living. Breakfast Kitchen  a spacious room great for entertaining with family and friends with lovely terracotta tiled floor. The room is filled with light from the dual aspect windows overlooking the gardens and the views. The kitchen is well appointed with a range of light wood units and eye level plate racks with built in 'Bosch' dishwasher and fridge with further space for 'American' fridge freezer. The exposed stone wall is a lovely feature with 'Leisure' range cooker situated to the front with extractor hood over and further exposed stone wall to side with inset timber shelf. Stable door gives access to the rear gardens. Cloakroom- with two piece cream suite. Study  lovely and light with window to rear overlooking top paddock and French doors flowing out on to the rear patio, great for 'Al fresco' dining. Landing; spacious galleried landing with step up to master suite with window overlooking the rear paddock and step up to bedroom three and four. Door to walk in airing cupboard housing the 'Worcester' boiler. En-suite Bathroom  four piece cream suite with corner bath and separate shower cubicle, heated towel rail and window to side aspect. Bedroom 2  double bedroom with window to front aspect taking in the views across the rolling countryside. There are a range of light wood built in wardrobes with dressing and bedside tables. Bedroom 3  double bedroom streamed with light from the dual aspect windows overlooking the front and rear aspect taking in the countryside views. There is a built-in two door wardrobe. Bedroom 4  double bedroom with windows to rear and side aspects overlooking the top paddock and the small water feature. There is a built-in two door wardrobe. Family Bathroom  a stylish room with neutral beige tiling to walls and wood effect flooring. Three piece white suite with contemporary bath and shower over. A striking feature is the tiled recess with step up and wooden shelf with counter top basin. Family Shower Room  light with neutral beige mosaic tiling to walls, two piece white suite with basin inset into vanity unit providing good storage and walk in shower cubicle with power shower. Open plan sitting/ dining room and kitchen. A spacious room with vaulted ceiling and streamed with light from windows overlooking the countryside views. There is a striking stone built fireplace housing the multi-fuel stove. The kitchen is well appointed with cream shaker style units with built in oven and hob and dishwasher space. En-suite  with two piece white suite and separate shower cubicle with power shower. 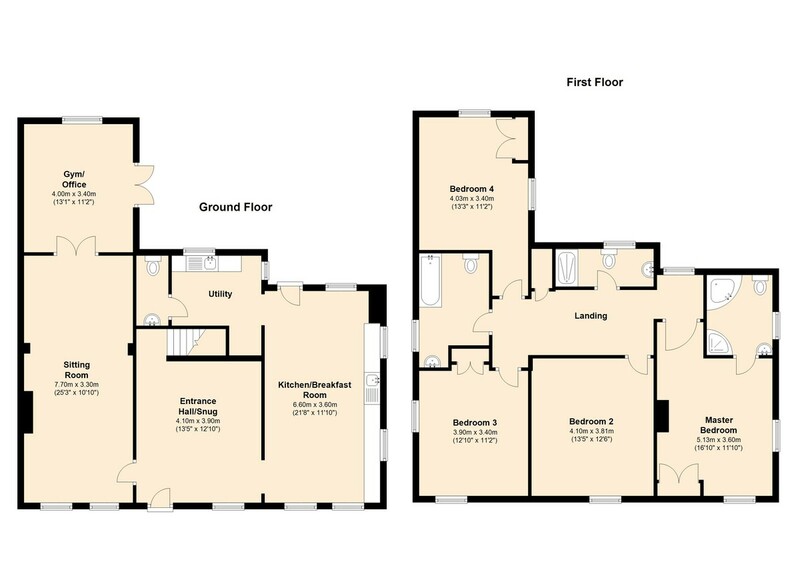 En-suite - with two piece white suite and separate shower cubicle with power shower. Utility room with dog shower  a great space with base units and sink with space for fridge freezer. door leads into a w.c.
To the exterior of the property paved patio runs to the front of Honeysuckle cottage and opens into a wide flagstone patio seating area with access to the utility room . A lovely space for entertaining or relaxing whilst taking in the delightful views. There is a large garden lawn area to the front and side of Honeysuckle Cottage. To the rear of Honeysuckle Cottage is a lawn area behind where solar panels. Part converted with central heating boiler and air source heat pump already connected. 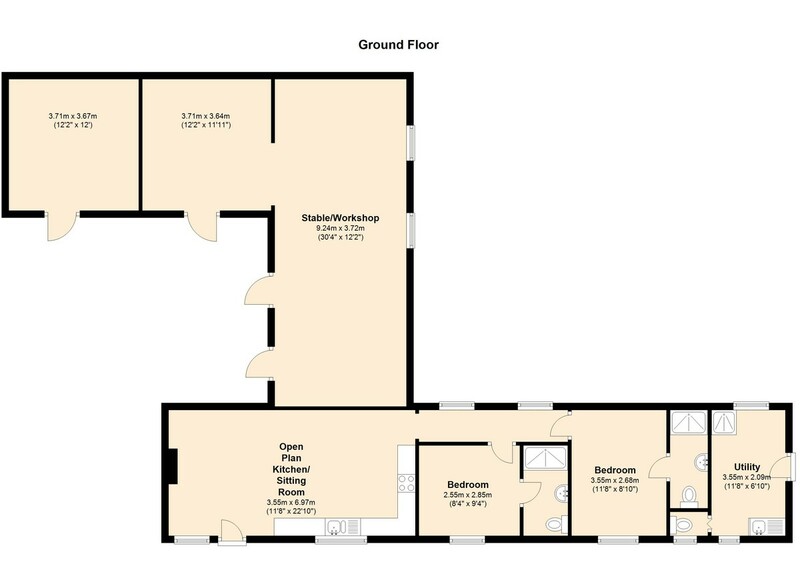 This further two bedroom holiday let requires minimal outlay and cost with windows, underfloor heating and insulation ready to install. Originally a stable block this has been left for those looking from equestrian background that may prefer to use for horses. Potential Holiday Let: To the last paddock is the 'Red Barn' with separate vehicular access, it is worth noting that this barn as we understand has footings in place and that the Forest of Dean Council it is believed would welcome the conversion of this into a further holiday let, or perhaps an annexe as ancillary accommodation to the main residence. EXTERIOR The property is approached from a quiet country lane and sits in approximately five and a half acres with panoramic views across the rolling countryside with a backdrop across the wonderful Forest of Dean. There are three separate paddocks, which offer a mixture of flat and sloping fields with separate gated access. There was originally a ménage which is currently used as a dog agility area, and there are wooden outbuildings adjacent to this. The main gardens have been beautifully manicured and offer an abundance of colour and fragrance from the many flower and shrub borders. A large lawn is a lovely feature to the front of the property with beautiful apple and cherry trees. A gravel path meanders to the rear garden which leads to flagstone patio, low feature walling stocked with shrubs with steps up to level lawn. LOCATION Nestling between the villages of Flaxley, Little Dean and Blaisdon, Elton offers perfect rural living and yet is within convenient access to main road network links. The A48 gives good access to Gloucester, Cheltenham, Chepstow and Bristol giving easy access to the M5. The property sits approximately a mile from the popular village of Westbury-on-Severn which has petrol station and stores, school, dentist surgery, public house and cricket ground. The thriving market towns of Monmouth and Ross-on-Wye are both approximately 30 minutes away. DIRECTIONS Starting from Ross on Wye head on the Gloucester A40, prior to Lea turn right onto Turn right onto B4224 heading towards Mitcheldean. Turn right onto B4224, Turn right onto Bradley Ct Rd/B4224, continue to follow B4224, at the roundabout, take the 1st exit onto Gloucester Rd/A4136, Turn right onto Abenhall Rd, Turn left at Lower Spout Ln, Continue onto Flaxley Rd for approximately 2 miles and the Restricted usage road destination will be on the left. Turn left onto the small lane continue to the right and Sunnybank can be found on the left hand side.